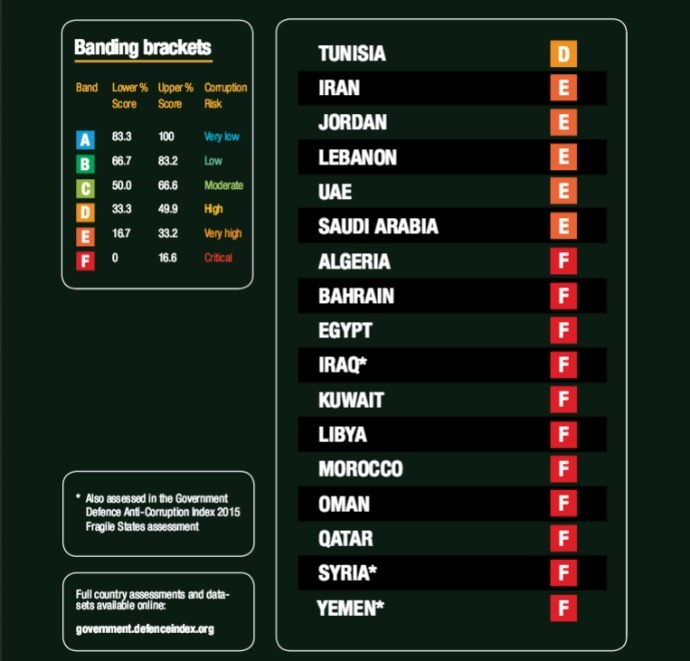 The investigation examines government defense corruption in Tunisia, Iran, Jordan, Lebanon, UAE, Saudi Arabia, Algeria, Bahrain, Egypt, Iraq, Kuwait, Libya, Morocco, Oman, Qatar, Syria, and Yemen. These countries together account for $135 billion in military spending in 2014 alone, making their expenditures as a percentage of GDP the “highest in the world,” the report finds. Researchers assigned all of these countries a “D,” “E,” or “F” grade for corruption, with the majority in the latter category denoting “critical” risk. The United States is the major supplier for the majority of these countries, with the United Kingdom, Germany, and Russia also significant exporters. The role of the United States in driving this arms flow was well-established long before Transparency International’s report. The Stockholm International Peace Research Institute found earlier this year that, between 2010 and 2014, the United States was the world’s top supplier of arms, accounting for 31 percent of global exports. This compared with 27 percent for Russia. The IHS Jane’s 360 report, released in March, found that Saudi Arabia was the “number one” military trading partner with the United States in 2014. Earlier this month, the U.S. Department of Defense announced its approval of an $11.25 billion deal to sell combat ships to Saudi Arabia, which has been waging a military assault against Yemen for more than six months. The Transparency International report shows these sales are fueling internal corruption and excessive militarization.